This is for the Where’s Waldo lovers out there looking to inject a little more adrenaline and social fun into their hidden object finding. In general, I would say that the iPhone doesn’t lend itself well to family game nights, but Pictureka is a lively exception to the rule. A port of the popular board game, Pictureka has gaming heavyweights Hasbro and EA behind this surprisingly bouncy and engaging app for almost all ages. Pictureka comes with two different playing modes, a single player adventure mode and a local, “pass and play”, multiplayer mode. Gameplay is based around large, fantastically illustrated, static images populated by hundreds of random objects, people, animals, etc. 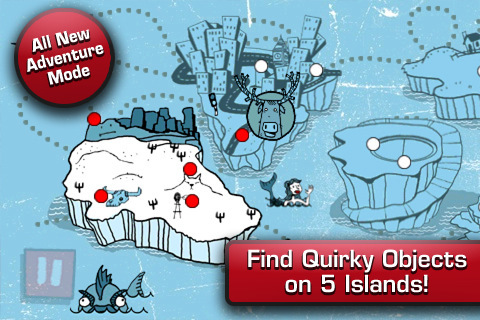 In Adventure mode, each level has you racing to locate items in a vast sea of jumbled stuff before time runs out. Multiplayer mode uses the same seek-and-find mechanic, but gameplay is a little more complicated. Once you’ve selected your opponents, either flesh and blood or AI, you roll a color-coded die to determine your task. The die decides which of the three task cards you’re assigned. A red card has each player bid on how many of a particular object they think they can find in a given time limit. A green card has you roll a die and challenges you to find that many of an object. Finally, a blue card has everyone racing to find an object the fastest. Succeeding at or failing a challenge wins you cards. You can tweak the settings at the beginning to choose which color cards you want to play with or how many cards you need to win. 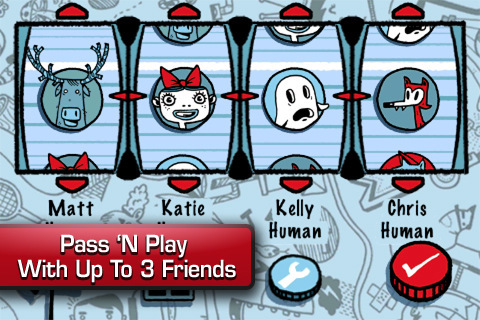 There is also space for up to four different player profiles, complete with customizable avatars, in addition to several AI players. The AI is a little frustrating in the game, since it seems to swing back and forth from mind-numbingly stupid to practically psychic, which makes the experience a little uneven, but overall the multiplayer experience isn’t too bad. Less than perfect are the bumpy touch controls and awkward scrolling issues. There’s no way to tell just how big a picture board is while you’re playing, which is frustrating when you’re trying to find things under a tight time pressure, and the lack of zoom is altogether puzzling. There’s also no penalty for random tapping, which is good in some ways, but takes away from the challenge on some level. Happily, the game makes up for some of its technical failings through an excess of artistic polish. The visual look of the game is cartoony and kid-oriented, but it’s also creative, interesting, and coherent. The sound and music for the game are also of very high quality, but the zany and hyper-active circus soundtrack did start to eat away at my brain cells after awhile. Overall, despite the flaws and incredibly irritating in-game ads plastered all over the main menu, at $1.99, this is still a very fun, fast-paced, family game you can play over and over again. AppSafari review of Pictureka! was written by Tracy Yonemoto on December 7th, 2010 and categorized under Action, App Store, Featured, Games, iPad apps, Multiplayer, Puzzler. Page viewed 5516 times, 3 so far today. Need help on using these apps? Please read the Help Page.